Each place setting has several layers. 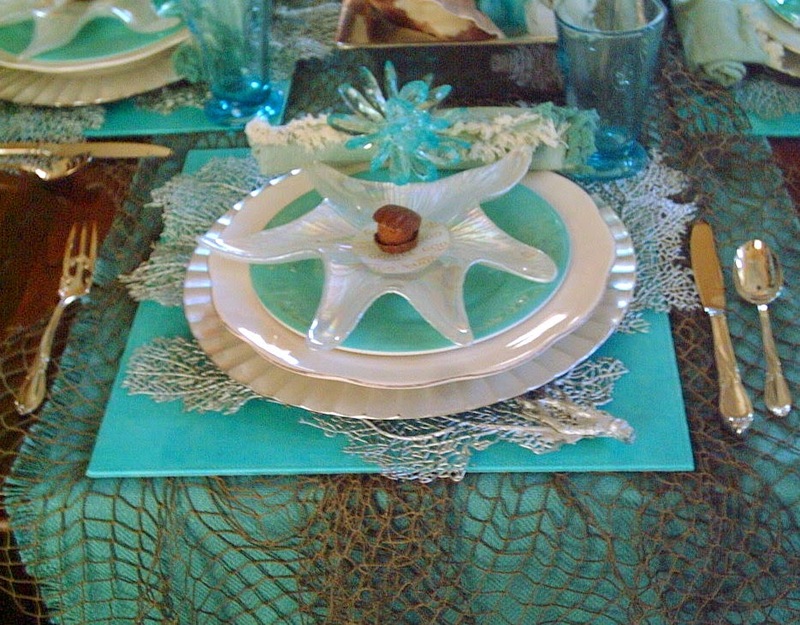 Bottom layer is a fishnet, with an aqua crocodile leather-like print placemat on top, next a silver coral placecmat, Now to the dishes, a silver scalloped charger plate , with a white scalloped plate on top. 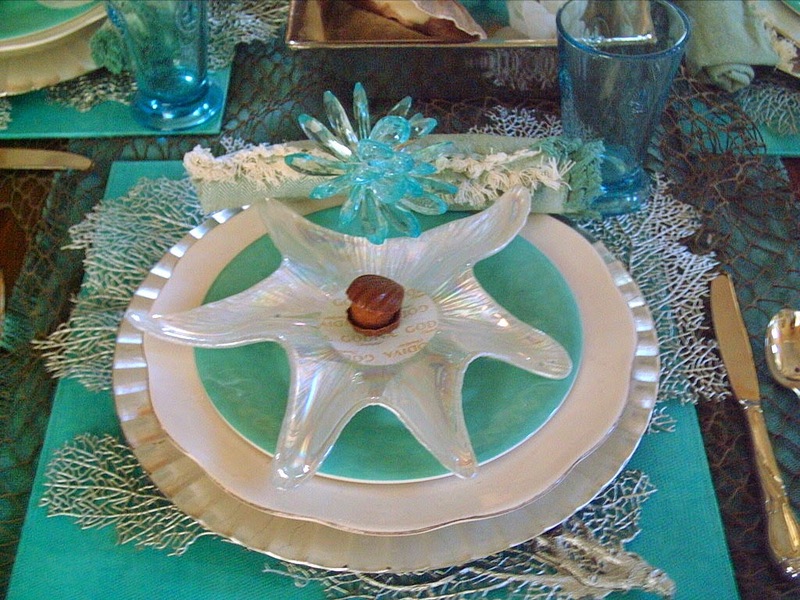 An aqua blue wavy salad plate and my favorite, a pearlescent star fish on top! I made the napkin rings from a spray of crystal flowers from Z Gallerie. I cut each stem, formed them into a circle and wrapped with floral tape. I love how they turned out! A Godiva chocolate completes the setting. Every dish shape or color reminds me of the ocean. Centerpiece base is an aluminum tray from "The Emporium" at Thanksgiving Point. I filled the tray with the whitest sand I could find and loaded it with lots of beach inspired items. 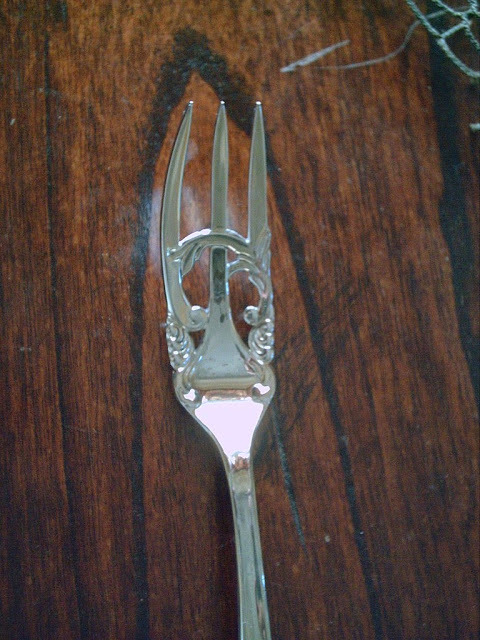 Close-up of the fork detail. It looks like the sea to me as well. It is a sold out pattern. Cache by Yamazaki. They do have this pattern in the gold accent still available. Photo of the left side of the silver look aluminum tray. Tray is loaded with my favorite Martha by Mail Candles. Sea glass in all sizes and shapes. Seashells, white and aqua crystal flowers, that look like sea creatures to me. One tall ceramic lantern from Pottery Barn and 2 aqua buoy's from there as well. Each had a wax battery operated candle in them that was set with a timer. This photo is a closeup of a few of my Martha Stewart by Mail Candles. The catalog is now closed so I am so glad I got these before it was too late. They were made in France with old molds exclusively for Martha's catalog. The list of stores I purchased these items at are in part; World Market, Z Gallerie, Z.C.M.I, Tai Pan, Home Goods, Walmart, Home Depot, Downeast Home, and Pottery Barn. I love comments. Please leave a comment.I will be posting this on Between Naps on the Porch Tablescape Thursday. I love this table. Although it is the night before Christmas I can feel the summer breeze and the salt in the air. 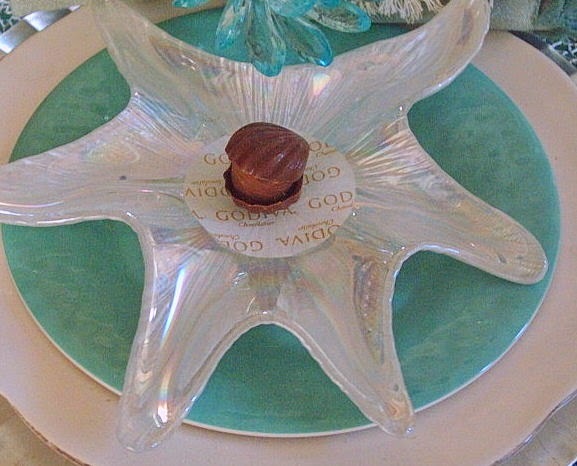 I used the same starfish plates for my 2013 New Year's Eve dinner. I can't wait to have time to look at the rest of your tablescapes. Beautiful! The shimmer of the aquas and the pearlescent starfish remind me that summer will soon be here again. I love the pretty candles and the Cache pattern of the Yamazaki flatware. Your stack is lovely and that starfish salad plate is stunning! Everything looks wonderful. 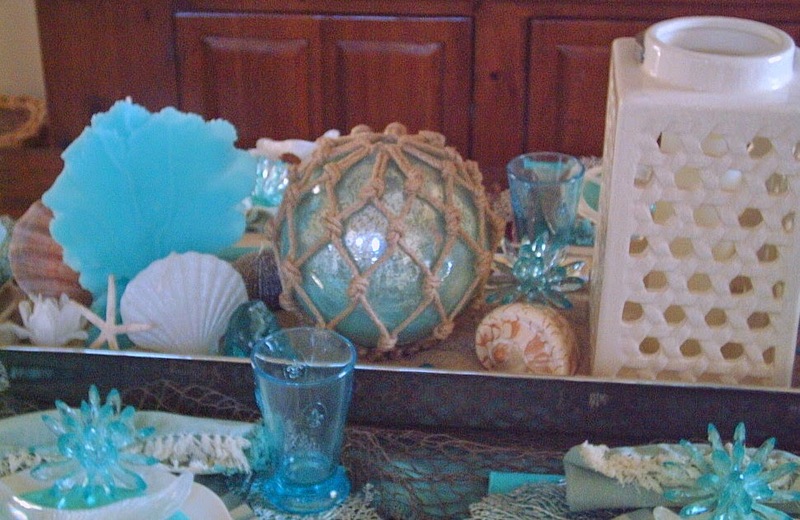 Transforming your dining table to the beach is a great accomplishment. Your lovely stack of plates is so pretty with the star plate on top. 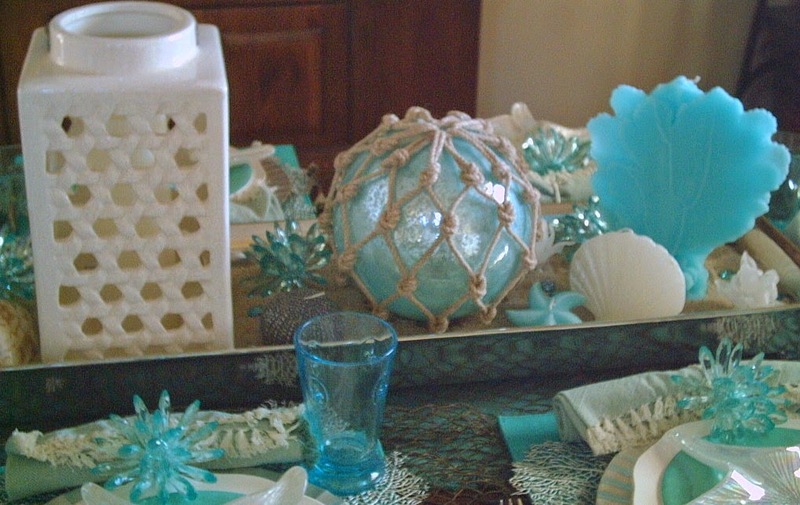 The shades of aqua and white are so wonderful with different pieces of sea motifs. This is one of my favorite color palettes as well as one of my favorite tablescaping themes. Gorgeous! Love all the beachy items, like the fish nets and the bouys. Beautiful! 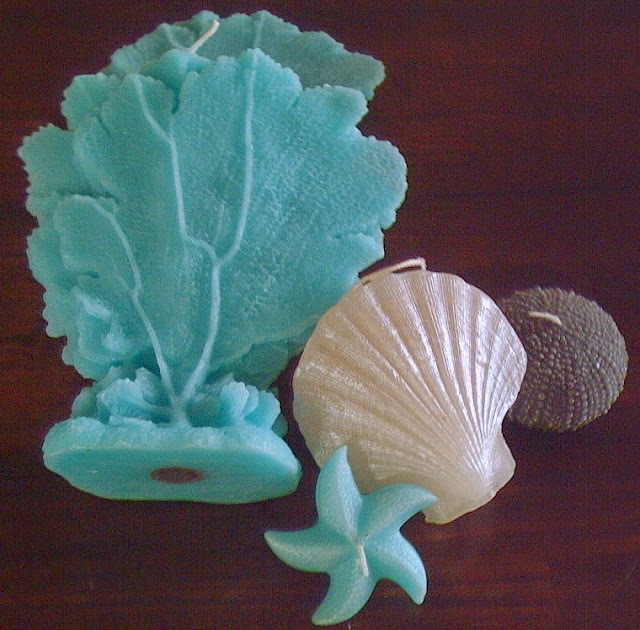 I love all the candles, the coral charger and the starfish plate! How cute and shiny! Valerie, this is stunning. 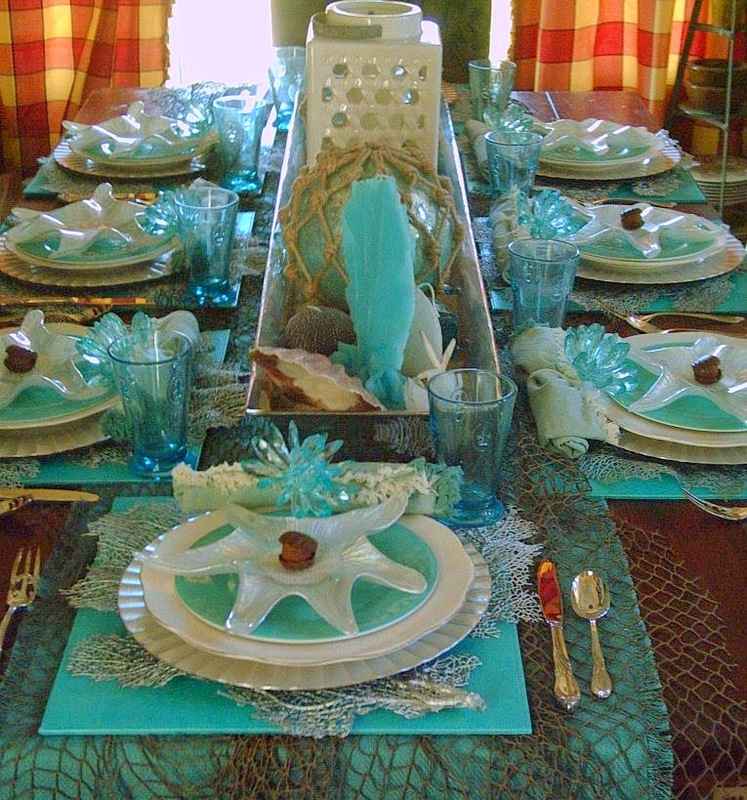 I love your use of aqua on this table, and oh my goodness, your place setting stack of place mats, plates, starfish and a chocolate is a work of art. I love the napkin rings. How smart you are to have created those. Well done! Hi dear Valerie....Sorry to visit you late. You have created such a beautiful blue themed sea table. Love the Martha Stewart candles. your center piece so very pretty. Happy to know your G daughter name is Lily. Presume she is beautiful as flower Lily. Happy week days to you. Love and hugs Sujatha.